Lactulose Sirup prescriptions are currently not available via our online consultation service. You can, however, request an online consultation for constipation. How to use and dose Lactulose syrup? When is it best not to use this product? Lactulose helps with hard stools (constipation). 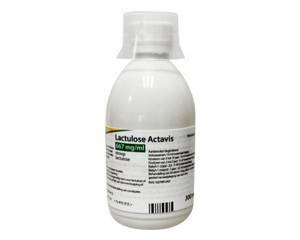 The active substance lactulose is converted in the intestines in natural acids (lactic acid, acetic acid). These acids draw water into the intestines and stimulate the intestinal wall. The stool is bulkier and softer and digestion is stimulated. Lactulose is not addictive and can also be used by infants, children, pregnant women and lactating women. You can order lactulose online through the chemists who work with Dokteronline.com. A prescription is not required. A difficult bowel movement is often caused by several factors, such as lack of drinking, a diet with too little fiber and lack of exercise. Sometimes certain medications can also cause illness or physical blockage, just like ignoring pressure. Lactulose helps to normalize bowel movements, regardless of the cause of the blockage. Adults and children ages above 15 years: 30 ml of syrup per day. Children from 7 to 14 years old: 15 ml of syrup each day. Children aged 1 to 6 years: 10 ml of syrup each day. Infants: 5 ml of syrup each day. Take lactulose preferably at breakfast. You can dispense the syrup with the supplied measuring cup. Take the syrup as is or dilute it with some water or juice. Try to drink a lot (at least 1.5 to 2 liters per day) when using lactulose. This promotes the action of the agent. It may take some time for lactulose syrup to reach the desired effect. If you notice no improvement after a few days, consult a doctor or a pharmacist. When the stool is soft enough, you can stop using lactulose or decrease the dosage to a maintenance dose. Do not use Lactulose for a longer period of time without a doctor's advice and read the instructions before use. a too high dosage can cause diarrhea. Take less lactulose if you suffer from this. The leaflet contains more information about side effects. If you suffer from severe side effects, consult a doctor. Lactulose is not suitable for people who are hypersensitive to any component of the syrup (see leaflet), and should not be used if you suffer from acute abdominal pain, intestinal obstruction or galactosemia. This laxative contains certain sugars. Talk with a doctor about using lactulose if you have an intolerance to sugars. Only give this self-care product to children and infants in consultation with a physician.